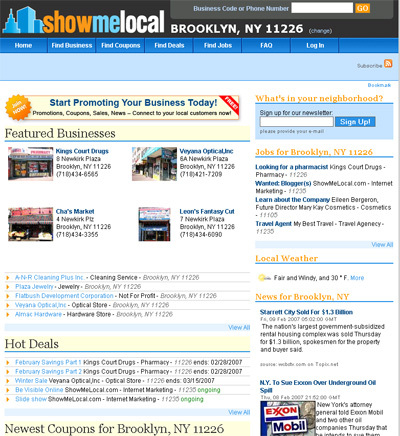 ShowMeLocal.com(SML) is a new kind of local business site. SML allows small business owners to quickly and easily get their business information onto the Internet and into the major search engines for free. But SML offers you more than just a static website. By using ShowMeLocal.com you can interact with your customers and form networks with other local businesses, adding true value to your business and building trust among your clientele. SML has pages designed for each zip code, and your listing is automatically plugged into to appropriate community page. Potential customers can visit your profile directly from the SML home page once it has been set to their zip code! SML also is a local search engine. Your profile, coupons, specials and jobs are 100% searchable. You are connected to your local customers from day one! SML offers the tools necessary to get your business information on the web. Along with a description of your business and contact information, SML automatically creates a map to your business based on your address. You can enhance your profile by adding nearly any type of information about your business, from menus to pricelists to job listings. You can also put coupons and specials on your SML profile, enticing customers both your web presence and to your storefront. Learning what your customers think of your business has never been easier, because with ShowMeLocal.com, visitors are able to rate and review your business and send you instant feedback on anything. Further, by utilizing the blog feature of SML, you can truly interact with your customers on a new and exciting level. Taking advantage of these features of ShowMeLocal.com is a crucial aspect of creating repeat business. But that’s not all. ShowMeLocal.com is specifically designed with the search engines in mind. Search engines such as Google and Yahoo! drive over 80% of all traffic on the Internet, meaning that you must have visibility in search engine in order to take full advantage of the web. 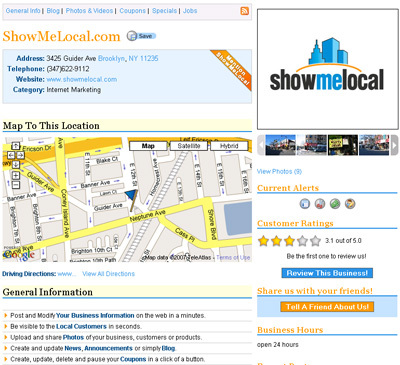 By using ShowMeLocal.com, you can take reap the benefits of our experience in targeted local search to help people in your area find your business via the Internet. SML is designed to help you garner better search rankings and allow consumers to find your business online. In coming posts on this blog you will learn how to specifically take advantage of ShowMeLocal.com’s numerous features to make your business standout and add value for your customers. This entry was posted on February 9, 2007 at 3:40 pm and is filed under ShowMeLocal Updates. You can follow any responses to this entry through the RSS 2.0 feed. You can leave a response, or trackback from your own site. This stuff is very well composed. The article was informative to elocutionists who exactly possess a great worth for articles. We look forward for more of the very same. He has detailed each and every little thing extremely nicely and in brief.